A good friend of mine brought us a bunch of wonderful vegan foods from Whole Foods Market just a couple of weeks after Tigger was born then she even held him while my husband, Snickerdoodle and I ate together as a family. It was a wonderful treat not to have to cook but an even more valuable treat to eat with the family without having to rush through to get back to the baby. 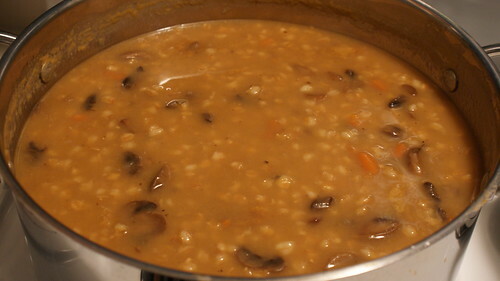 Anyway, one treat she brought was a rich and hearty mushroom barley soup. I hadn't had it before but once I tried it, I knew I'd have to come up with my own recipe so I could have it any time I wanted to. Lucky me, I had 2 packs of sliced mushrooms in the fridge from another recipe I hadn't gotten around to and they really needed to be used. In a large stock pot, heat the olive oil over medium heat. Add the onion and garlic and cook until the onion gets a bit transparent. Add the mushrooms and the carrots. Cook until the mushrooms are tender. Add the vegetable broth and barley. Bring to a boil then reduce heat and simmer for 45+ minutes or until the barley is plump. You can eat the soup at this point or you can continue to simmer it for an hour or more and eventually it'll look like the picture below. I like to let it cook long enough that the barley makes the broth thicker. I've found that this soup actually gets better as it sits in the fridge for a few days. If the barley soaks up too much of the broth, just add more broth. Serve with your favorite warm rolls on a cold day.